What do you do in a country, where almost every supermarket offers a choice of at least 30 beer brands? Exactly – you change your marketing strategy. 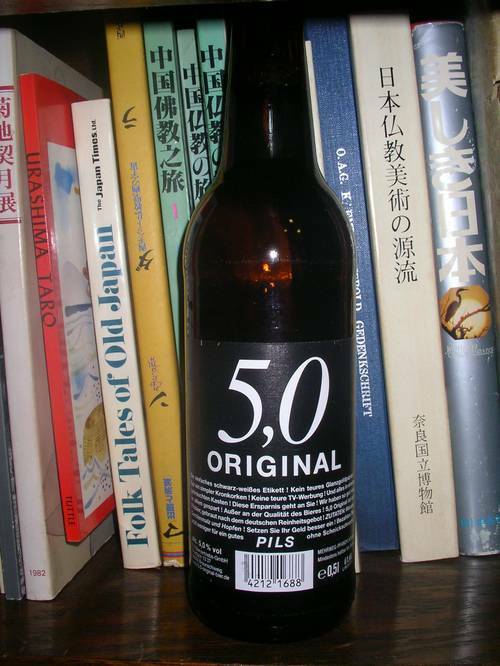 When I came across these crates of “5.0 Original Pils” beer on Sato afternoon, I first thought these guys are kidding me. 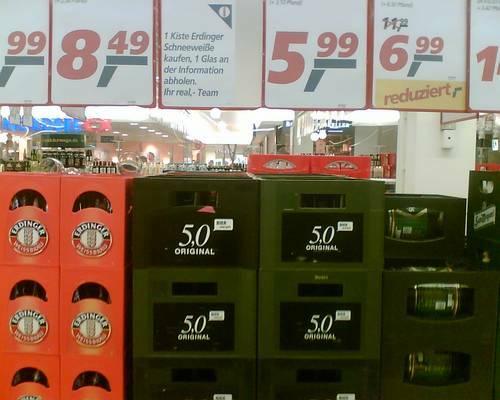 A whole crate of 5.0 Pils (@ 0.5l each) costs EUR 5.99! Now that’s cheap! In a country where the average beer consumption is ~117,5 ltr per person/year, buying beer quickly becomes a matter of the pocket. There’s one popular brewery in Germany with about 20 different beers on the market. It’s popular because it’s the cheapest brand out there, and they are cheap because the brewery directly sells to consumers & thereby avoiding resellers. Obviously, the competitors are envious of the success this cheaper brand has, and, more importantly: convincing customers on quality requires special approaches. Hence this new marketing strategy that lacks any further advertisment campaigns. Customers are approached where they actually purchase their beer. Smart. The sticker reads: “it’s just a simple label! no expensive golden label! a simple crown cap! no expensive tv advertisment! and everything in a used crate! we’re forwarding these savings to you! we’ve saved on almost everything! except for the quality of this beer!” etc…. That a good deal whats it compare to Tusker, Pili ama Guiness? Would you be interested in running a mail order beer business to the USA? For real dude. The price is Ok for Germany. It is a german market. No, better to Norway! ;o) Depending on the brand, in Norway you pay 2 to 10 Euro/0.5 l bier. Unbelievable.